Wild Card: Back to the Future time travel problem? Every once and again I’ll make these “wild card” posts that, strictly speaking, have nothing to do with baseball. This one’s about an apparent oversight with the year 2015 as portrayed in Back to the Future Part II. I’m sure it’s been discussed time and again, but it’s just been bugging me; I figured yesterday wasn’t the appropriate time to bring it up. It’s established several times throughout Part I that altering events in the past has immediate impact on events in the future. There’s the photograph that Marty has that shows his siblings and, eventually him, disappearing in real-time as George and Lorraine grow farther apart. There’s also the scene at the school dance where Marty begins to swoon and fade away before his parents kiss. In Part II, disregarding how ludicrous it is for Doc to take Marty and Jennifer to 2015 when, even after informing them of their failures as parents, they still see their children didn’t turn out all that well (there’s nothing they could do in the future that would undo something in the past that would simply occur again), there seems to be a slight discrepancy with how altering events affects the timeline a particular character is in. One one hand, as stated above, altering events in the past changes the present reality for characters in the timeline, but there really is only one timeline. On the other hand, you may remember Doc’s explanation of the timeline after they arrive in a bizarro-1985–or, rather, how some past event created a tangential timeline. This seems to imply that the original timeline (after the tangent splits) continues to run, and can still be accessed by those inside it. It seems that, unless the filmmakers made a huge oversight, the appearance of Hill Valley in 2015, after a very particular event, confirms this. After 2015 Biff follows the Delorean to the McFly residence, he steals the time machine while the three time-travelers are inside the house. We learn he went back in time to give the sports almanac to 1955 Biff, and ultimately see him return the Delorean to 2015 before Doc or Marty are any the wiser. 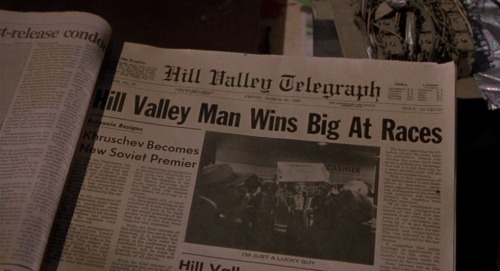 Between the events we see unfold later in the film (specifically, that 1955 Biff receives the sports almanac and, in alternate 1985, the newspaper headline from Biff’s first betting win in 1958), we can determine from the amount of time between 1955 Biff’s reception of the almanac and first use of it (about 2 1/2 years) that the sheer act of handing the book over to the “wrong” person creates the tangential future. After all, it’s only a few minutes between Marty and Doc returning with a comatose Jennifer to the briefly-stolen Delorean in 2015 and when they return to what they think is their original 1985. Because 2015 doesn’t change instantaneously, it implies that their timeline remained untouched, but that (presumably) an alternate was created as well. 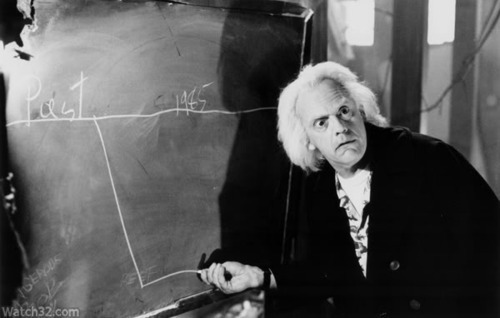 Therefore, when Doc, Marty, and Jennifer travel back in time to 1985, which occurred well after Biff created the tangent in 1955 by giving himself the sports almanac, it should have remained untouched. They could only access the alternate 1985 by traveling to some point in history prior to Biff receiving the book, as the alternate 1985 would become the new “normal” ’85. Which means that they don’t actually have any reason to travel back to 1955 for a second time after returning to 1985; which means the Delorean’s destination time doesn’t get set to 1885; which means Doc and the Delorean don’t get struck by lightning in 1955, sending him back seventy years; which means Part III is utterly pointless. So I’m assuming they just forgot to make 2015 change instantly at some point before Biff’s return from the past. Too bad, because that could explain why the Cubs ended up not winning the World Series this year.